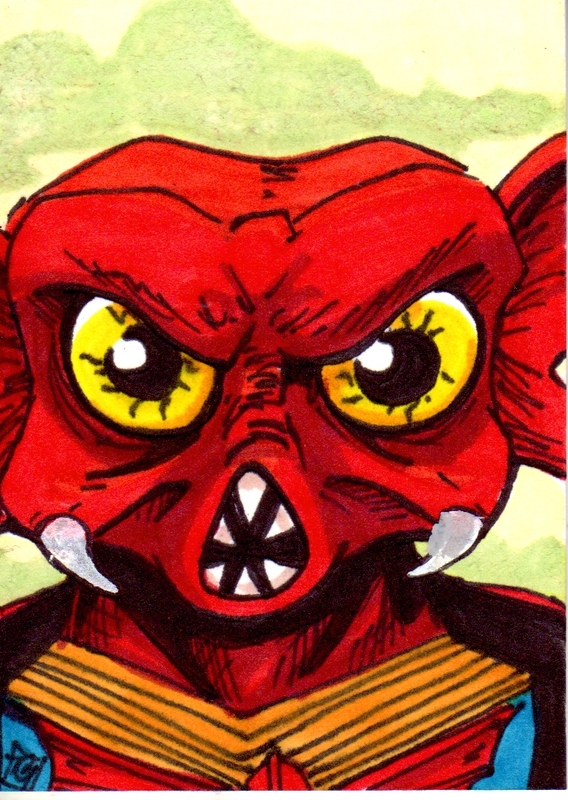 Taylor's Sweet Little Art and Nerd Site: Sketch card of the day! -Mantenna! Today's deviation is Mantenna. What a weird character! Seriously! When I started this card, I didn't have any reference material. I went based on what I had in my head. For the most part, I think I remembered his basic look, with the exception of his tusks. I had to put that in later, and they didn't scan well. But honestly, what is he? I had a Mantenna when I was young and I still kinda scratched my head as to what he was. I think back then, I just accepted him for what he was. I will have to say, due to the fact that I don't really know any of his background, I am looking forward to what his Classics version bio card will read. I'm also wondering if he will have 4 legs instead of two/two's molded together. Hurm. Who knows? You can also see this sketch card here. Just to remind you, there 1 day of voting on my new t-shirt design on threadless. If you have an account and want to show your love by giving the design a vote of 5, go here to see its posting.